Marketers on top of their game have learned to thrive in the age of VUCA. The age of volatility, uncertainty, complexity, and ambiguity prompts an increasingly competitive environment. Successful CMO’s today see changes as opportunities, not threats. Evolving social media trends, getting the right message to the right person at the right time in the overcrowded web, and the increased use of ad blockers all pose opportunities to enhance your marketing strategy. There are many questions about where the future of digital advertising will take us. The answer however does not lie in fortune telling the future. The answer lies in equipping your team with the right tools to tackle whatever the future may bring us. How do you stay competitive in an environment with so many independent variables that are constantly changing? Take control of the variables that you can influence, the conditions within your organization. Internally, create an environment where your people can thrive. Create an environment of courage, resourcefulness, and which caters to the development of individuals. Start by creating brand awareness within the organization. Create alignment in the purpose of the organization with the goals of employees. Once your brand has this self-awareness and clarity, your authenticity can shine through. In the world of advertising, those with inner clarity will not find themselves trying to fight external conditions. True marketing gurus have no need for their ads to push their way into the life of the consumer. Brilliant ads are neither intrusive, aggressive, nor demanding. The real success comes from brands that shine so bright with inner clarity, that their advertisements fill needs as they arise. Be aware; of your actions, of your communication, of your place in the market. Simon Sinek’s ‘Golden Circle’ is always a great place to start. The main idea behind the golden circle is to start with your purpose- why are you doing what you do, "what is the very reason your organization exists". Know clearly what your purpose is. Understand and effectively communicate the impact your organization aims to have on the lives of those you are serving. By expressing your ‘why’ through your actions and communications, you are making the first step towards attracting your target audience. You’re emotionally engaging the people who believe what your brand believes. A clear purpose creates an internal environment of stability, alignment, and cohesiveness. When your employees believe in what they are doing they are fulfilled and inspired. They have the power to become the greatest supporters of the brand. Each employee is not only the supporter of the corporate employer brand, but they are an employee brand of their own. The concept of ‘employee branding’ has to do with investing in in employees ‘personal’ brand. By investing in employee branding, the organizational power is strengthened from its core. Employee social media branding has been tested to have up to 8x more reach than the employer brand. Empower employees to be their best versions, to co-create, advocate, and communicate on behalf of the organization. Getting employees to love their brand is clear, but how do you get customers to love your brand? The 'Golden Circle' methodology promotes clearly expressing what you believe through your purpose. The moment you communicate what you believe to customers who believe the same, you’ve got a loyal customer. When customers have had a truly great experience with you, and believe in what you are doing, they promote your brand. People love to help others through sharing experiences. It may be to their colleagues over coffee or to friends at a get together. People feel good sharing something helpful, and inspired when talking about something they believe in. How do you help your customer share this message, making them feel good and your brand grow? Make it simple. When your feedback shows that your customer had a positive experience, invite them to share it. This mutually beneficial relationship reinforces a stronger emotional connection. To scientifically test just how strong this connection is, you can obtain a net promoter score, a ‘mathematical classification of a consumer’s brand loyalty’. To stay competitive in the age of VUCA, create authenticity in brand and marketing. Authenticity in brand comes from fostering a strong internal environment. 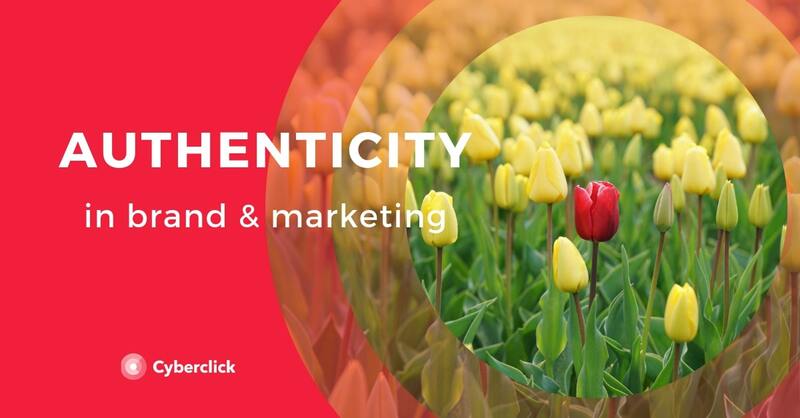 Authenticity in marketing arises when employees and customers share your message. The most powerful message is not sent from the organization itself, but from others who believe in what the organization believes.